The biggest news is that Gallerie Karon is expanding! Our new addition, “The Feathered Wing”, will be open by the holidays! In this new area, accessible through our main gallery, is a two part section. The first is full of small, multiple use furniture pieces for smaller spaces. 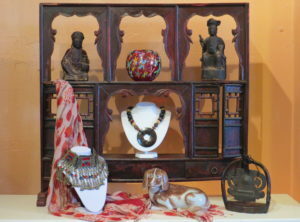 The second is a special area for Oriental furniture and accessories with larger scale antique Buddhas and Quan Yins. It’s a serene room far away from todays problems and filled with things that you can use to create your own serene space at home. We’ll have a grand opening later once we have completed the expansion but the move has started! ←Previous Post: Faces, Hidden and Revealed – Held Over!